Summary: In the second post on the Gyakuten Saiban 4 (Ace Attorney 4 – Apollo Justice) blog (originally posted on March 23, 2007), director Endō Mitsuru writes about two new features in this game. First of all: himself, as he is new to the development team, and he talks about how he got himself in the development team. He also talks about an actual new feature in the game: Perceive. The sketch Takumi made is a must-see. Images are taken from the source article. Copyrights belongs to the respective owners. Hello. My name is Endō, and it’s my first time working on the Gyakuten Saiban (Ace Attorney) series. I still remember that when I heard that they were going to develop Gyakuten Saiban 4 (Ace Attorney 4 – Apollo Justice), I went to a Capcom bigwig so they could sneak me in the team. Endō: Please, I want to join the Gyakuten Saiban 4 team. Endō: Oh, yeah, I once shared a yakisoba with Mr. Takumi! Look here, a photo of that! Bigwig: You’d better not show that picture to other people. It… it’s easily misunderstood. Was it the picture of the yakisoba that had worked? Anyway I safely managed to join the development team of Gyakuten Saiban. For those who have just joined their companies, I recommend you taking photographic evidence if you go have a meal with your bosses. You never know when they might come in handy. 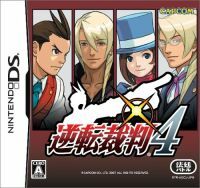 Let’s talk about making Gyakuten Saiban 4. New features that fit a new Gyakuten Saiban. How these ideas turned out? I’ll talk about them as I dig through my muddy memory. Right after development was decided, we had three planners. It was a very Humanities-like set-up, as we all loved mystery fiction, and hated exercise. 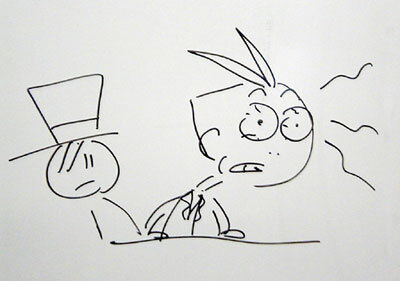 We were the irregulars among all the brawlers in Capcom (← just my own personal image). We had heated discussions, and ideas for new features kept coming up. From normal ideas for mystery fiction, to totally unexpected ideas. We came up with a lot of ideas. The new feature we thus added to the game is Perceive. It was the first time we’ve done something like this, so we had to do some experiments. At the moment, “Perceive” is in black-and-white, but there was a time it was in color. When we asked around in the team, many said that black-and-white looked good, so that’s what we settled for. If things had turned out differently then, Perceive would have been very different now. This is the rough sketch Mr. Takumi made then. Takumi: Impact is important with these kinds of things. Takumi: You sometimes say things in a really outdated way. I’ll passing the baton (another old saying) to Yamazaki, one of our planners who has worked on Yomigaeru Gyakuten (Ace Attorney DS) and now this game. It’s the first time I’ve worked with him, but even in this short period of time, we’ve managed to share more laughs and tears than I can describe. We love the same writers, but the things we like about them are slightly different, but taken all things together, he’s one of my precious comrades. We’re not that close we can share a yakisoba, but he’s a man I can trust. I’m sure he’ll be able to talk enthusiastically about Gyakuten Saiban 4 from a young and flexible point of view.